This pendant from Jerusalem-based Israeli jewelry designers Emunah Jewelry lets you wear a bit of the Holy Land close to your heart – literally. 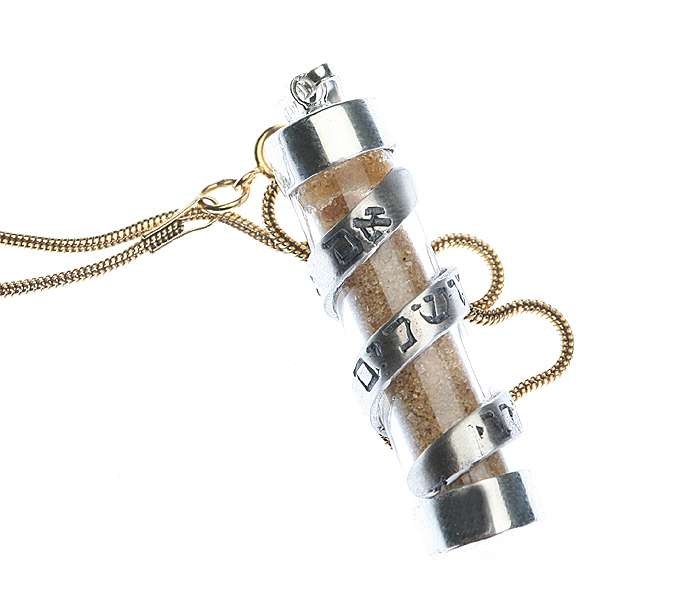 This glass and sterling silver pendant consists of a small glass tube containing a bit of earth from the eternal city of Jerusalem. A band of silver twists up the outside of the tube, protecting it and its contents from impact or breakage. The silver band is engraved in Hebrew with a prayer for Jerusalem. Emunah Jewelry creates statement pieces of Jewish jewelry, offering contemporary takes on traditional themes. Their designs will appeal to anyone who appreciates a modern interpretation of classic jewelry motifs in fine silver and gold. Jewelry makes a wonderful gift or souvenir of a visit to Israel. Wear this pendant yourself or give it to a loved one, whether you've visited Jerusalem already or haven't yet been. All of Emunah's jewelry uses the best materials available – 925 sterling silver, 9/14/18 karat gold, pewter, and precious and semiprecious stones. Each piece is stamped with the company's ID to ensure quality and prevent imitations. All Emunah jewelry comes with a warrantee.